In order for mobile services to achieve the scale, scope, and agility required to keep them relevant and successful, a number of fundamental technical and business challenges need to be addressed. The Fabric of Mobile Services provides readers with a solid understanding of the subject, covering short-and long-term considerations and future trends that will shape thistechnological evolution. 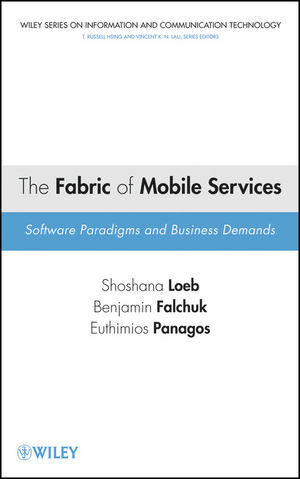 Complemented with case studies and end-of-chapter summaries that help facilitate readers' comprehension, The Fabric of Mobile Services is essential reading for researchers, engineers, software engineers, students, and anyone working in the mobile services industry. Shoshana Loeb, PhD, is Executive Director and Chief Scientist at Telcordia Technologies, Piscataway, New Jersey. She has a proven track record in creating, financing, operating, and growing innovative technology organizations and businesses. Ben Falchuk, PhD, is a Senior Research Scientist in the Software & Applications Lab at Telcordia Technologies. He has a long and diverse background of innovation in practical R&D related to the areas of mobile, multimedia, HCI, and middleware. Euthimios Panagos, PhD, is a Senior Scientist at Telcordia Applied Research. His expertise lies in the areas of distributed data management, strategic planning, engineering, marketing, and client engagement. 1.4 Emerging Mobile Services Environments - Network View. 3.2 LBSs - The Killer Enabler. 4.2 User-Centered Simplicity and Experience. 5 The Always-on Infrastructure Challenge. 5.2 Architecting for Always-on Mobile Services. 6.3 Design of Opportunistic Systems - Examples. 7.6 Use Case: Voice-based Content Management. 8.3 Getting Personal - What it Takes and Why it’s Important. Information and Communication Technology Series"